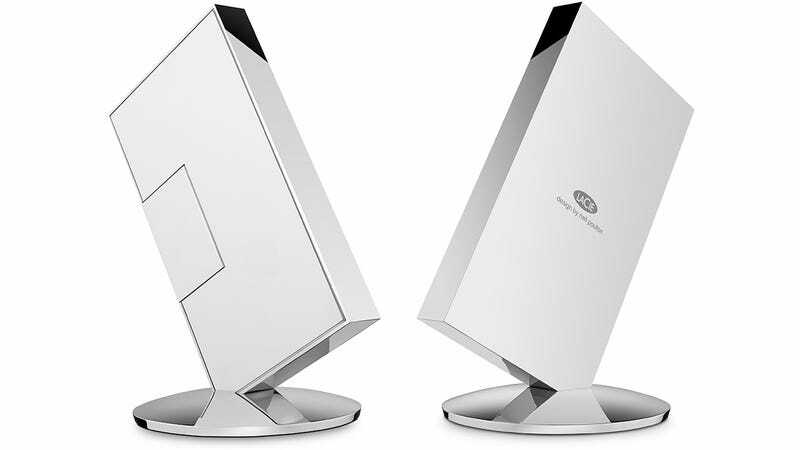 It wouldn’t be CES without LaCie teaming up with an accomplished industrial designer and rolling out a fancy new desktop drive. This year it’s called the Chromé, and designer Neil Poulton appears to have taken his inspiration from the VHS cassettes that few of us can even play anymore. The Chromé is exclusively available in one terabyte capacities, so it’s far from the most spacious drive you can have sitting on your desk. But it makes up for that shortcoming with speed. Inside the Chromé you’ll find a pair of 500GB M.2 SATA SSD drives delivering transfer speeds of up to 940 MB per second. And like the Porsche Design Mobile Drive that LaCie rolled out last March, the Chromé comes with a USB-C connection on the back, so fumbling to blindly connect a cable on the back is slightly less annoying when it’s reversible. Finished with a hand assembled and polished chromed zinc enclosure, the LaCie Chromé comes with a matching dock that holds the drive vertically using strong neodymium magnets. At $1,100, available in a few months, it’s about twice as much as you’d pay for a one terabyte SSD these days. But LaCie’s drives have always been squarely targeted at those who care as much about how their gear works as they do about its performance.